If you don’t want to wait through a molt, you can cull non-laying birds and replace them. Culling chickens is the removal of birds in your flock that are not laying or developing as they should. If the bird is not sick, it is perfectly suitable for home cooking. You should always cull lame or sick chickens, because they are not productive and may spread disease. A hen will give many clues that she is no longer laying. Non-laying hens have small, dull combs rather than the bright red combs of layers. Their vents will be small and dry, not stretched by egg production. The width between their pubic bones will be just one finger, not two or more, and the depth between pubic and keel bones will be only a few finger widths rather than four or more. The feathers will be ragged, with no apparent new feathers. On the other hand, culling may not be an option for less productive or non- productive hens that have endeared themselves as pets, or if your goals are primarily to simply watch and enjoy your birds rather than obtain maximal egg or meat production from them. 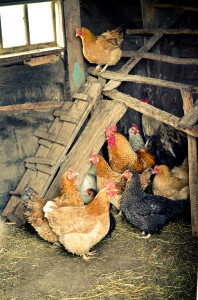 With good care, many types of poultry can live 20 years or more! This entry was posted on Saturday, June 16th, 2018 at 3:51 pm	and is filed under News & Updates. You can follow any responses to this entry through the RSS 2.0 feed. Both comments and pings are currently closed.